Just a memory; play-acting, really easy. Denise Dumars is the author of Paranormal Romance: Poems Romancing the Paranormal, nominated for an Elgin Award. She also has been nominated for Rhysling, Dwarf Stars, and the Best of the Net awards for individual poems. She writes short fiction and metaphysical nonfiction. A novel that she wrote with Corrine DeWinter is currently seeking publication. She teaches college English in the Los Angeles area. 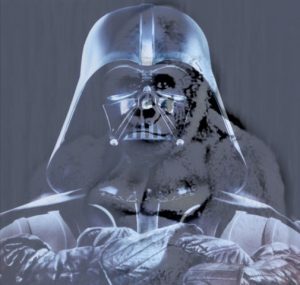 Editor’s Notes: “Skunk-apes with exoskeletons” stimulated the enhanced effects of an ape image in Darth Vader garb.